A unique approach to solving HPLC problems. 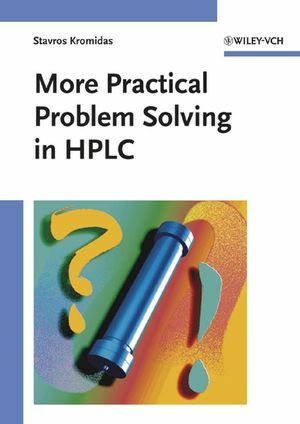 Everyone who bought "Problem Solving in HPLC" by Stavros Kromidas will equally benefit from nearly 100 new practical examples for optimization, trouble-shooting, and instrument performance given in this sequel. - advice for optimizing separations, always explaining the reason why. In each case the problem, the solution and the conclusions are presented over a maximum of 4 pages, and in addition the book contains manufacturers' addresses, references, data tables and checklists. Stavros Kromidas worked as Sales Manager for Waters Chromatography following his PhD thesis completed in 1983. From 1989 to 2001 he was Managing Director of Novia GmbH, a consultant company for analytical chemistry and is an independent consultant since then. He has worked in the area of HPLC since 1978 and has given lectures and training courses since 1984. He is author and co-author of several articles and numerous successful books. Did Peaky Remember His Lesson Correctly? "The book is very clearly written, clearly arranged, clearly laid out and concise. ... the book holds valuable and applicable information, which make it a useful reference book for analytical questions/problems and their answers/solutions." "This book is very readable and written in a light mood...suitable as a reference for scientists utilizing these associated methods...Highly recommended." "Thanks go to the author for sharing a quantity and depth of knowledge that can be obtained only from decades immersed in the field." The fast way for solving HPLC problems! A unique approach to solving HPLC problems. Nearly 100 new practical examples for optimisation, trouble-shooting, and instrument performance in this book. Gives advice for optimizing separations, always explaining the reason why. In each case the problem, the solution and the conclusions are presented over a maximum of 4 pages, and in addition the book contains manufacturers' addresses, references, data tables and checklists. This unique approach cannot be found in any other HPLC book.